This is a really interesting book, from the guy who wrote The Men Who Stare at Goats (which I haven’t read yet). Ronson tells a series of stories about his experiences over the past several years, which he weaves into an exploration of the place occupied by mental illness in our society. Ronson writes about an institutionalized “patient” who claims to have faked insanity to avoid a prison sentence, about scientologists campaigning against psychiatry, and about Bob Hare, the inventor of the 20-point checklist for diagnosing psychopaths. Along the way, Ronson reveals his growing realization that he and other journalists and media producers are complicit in the perpetuation of a madness industry that has gained incredible power and produced incredible fortunes over the last couple of decades. The madness of the madness-spotters is funny and scary at the same time.I actually bought the Audible audio version of this first, and then picked up the Kindle version so I could highlight and comment. Ronson reads the book himself, which I think is brilliant, especially given the conversational tone and the ironically self-deprecating way he makes some of his most important points. One of these points is that it’s rarely a question of someone else doing something, while we stand by innocently observing. For example, when (psychopathic?) Wall Streeters went on a rampage of cost-cutting that reduced workforces — that is, closed factories and bankrupted towns across America — Ronson describes it this way: “It was like in the Coliseum. You had the entire crowd egging him on. So who really is the villain? Is it the one who’s making the cuts? Is it the analysts who are touting it? Is it the pension funds and the mutual funds who are buying?” “Of course that was all twelve years ago now,” I said. “Has anything changed?” “Not anything,” Jack said. “Zero. And it’s not just in the U.S. It’s all over the world.” (Ronson, Jon (2011-05-12). 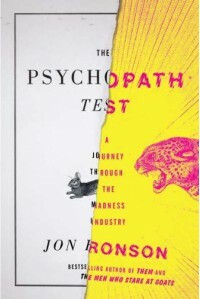 The Psychopath Test: A Journey Through the Madness Industry (pp. 166-167). Penguin Group. Kindle Edition)He concludes that passage by observing (and my Kindle informs me this has been highlighted 197 times so far): “If you have the ambition to become a villain, the first thing you should do is learn to be impenetrable. Don’t act like Blofeld—monocled and ostentatious. We journalists love writing about eccentrics. We hate writing about impenetrable, boring people. It makes us look bad: the duller the interviewee, the duller the prose. If you want to get away with wielding true, malevolent power, be boring” (p. 168).Along the way, Ronson uncovers some really important stuff. He gets an admission from Dr. Allen Frances, the editor of the diagnostic manual DSM-IV, that “There’s a societal push for conformity in all ways,” he said. 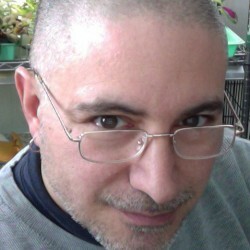 “There’s less tolerance of difference…It’s very easy to set off a false epidemic in psychiatry…And we inadvertently contributed to three that are ongoing now.” “Which are they?” I asked. “Autism, attention deficit, and childhood bipolar,” he said. (pp. 243-245)This “societal push for conformity” is why it’s important for me to complete my writing about nonconformists in history. But more on that later. Another quotable bit (with 251 highlighters to date, according to Kindle): “Serial killers ruin families.” Bob shrugged. “Corporate and political and religious psychopaths ruin economies. They ruin societies.” (p. 112) Whether you call them psychopaths or vampire squids, he’s got a point.